Challenge accepted! This week I'm linking up with the ladies from My No Guilt Life, Run the Great Wide Somewhere, and MCM Mama Runs to talk about those crazy back to back (to back to back) challenges. I love these challenges, and Disney does them the BEST! Okay, I don't have much to compare it to, but I can't imagine a better race series than Disney! 1. Train! I get on my high-horse here, and it should go without saying, but you need to train for races. I know these can be "fun runs" but trust me, it's more fun when you have a great race and you're not dying of pain. 2. Train how you plan to run the races. When I did the inaugural Dopey, I modified different training plans and actually did my runs with the same pace and intervals that I ran on race day when I did my weekends of running back to back. When it came time for race day, there were no surprises! 3. Set individual goals for each race. Some you might run slow and take pictures. Some you might race. The most important thing, though, is that you look at your individual ability and set your goal based on your training...and stick to it! 4. Don't be afraid to PR! You'll hear plenty of people who will tell you a challenge is not the time to run your best race. I say, do it (especially if you followed tip 1 & 2). 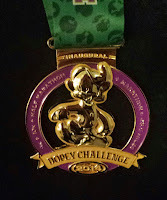 I PR-ed my marathon at Dopey, after running a 5k, a 10k, and a half. I had a plan, I stuck to it, and I left it all on the course. Oh...and I shaved 26 minutes off my best marathon time! Seriously the BEST running moment of my life! 5. Have a recovery plan. 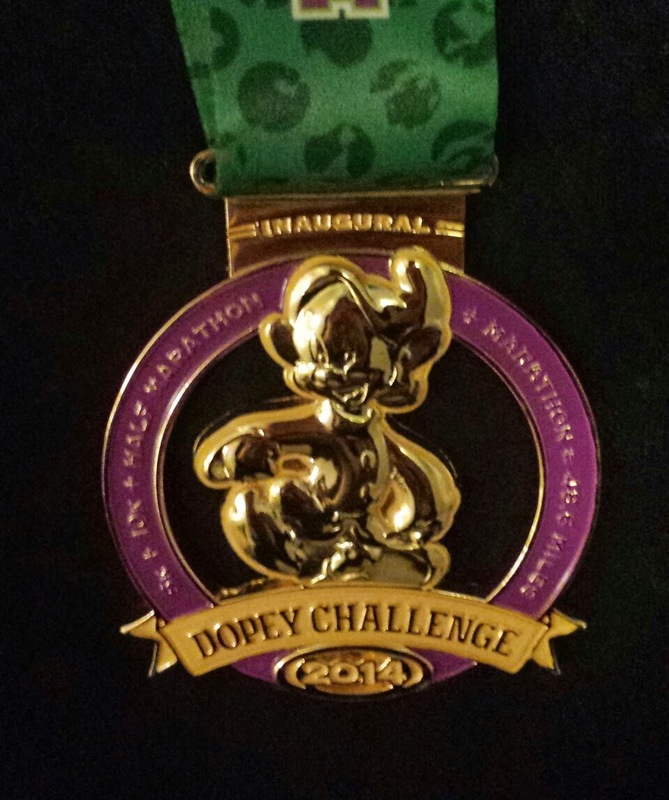 I've talked a lot about Dopey, but my first challenge was the "unofficial" Dopey where I ran the 5k, half, & full. I had to figure out a lot about my body and recovery while prepping for that race--what to eat, what to drink, ice baths, compression gear, all that stuff! I'm still fine-tuning, but I have a pretty solid routine. This is another part of training, so play around with what works for you. 6. Focus on hydration pre, during, and post race. Dehydration is the enemy, so throughout your training, figure out what works for you. Remember, you are hydrating for the final race, so be sure it's on your mind. 7. Don't sit around. Yes, rest is an important part of recovery, but you also need to keep those muscles loose. Personally, I hit the parks between races (well..and before and after and any chance I get). I don't go crazy and I make sure I'm not hopping from one end to the other, but strolling through Disney keeps my muscles moving. I highly suggest you leave your FitBit off, though...it can really psych you out knowing you did an extra 7 miles the day before a marathon! 8. Get enough sleep! These are EARLY race mornings and tempting park nights. Yes, you will miss the fireworks and Fantasmic, but remember what you are ultimately there for! I typically head back to my room around dinnertime. Even if I can't sleep, I lay in bed, watch TV, and just relax before the next race. 9. Know before you go--about food! We all know that fueling properly is important, but it's even more important for challenges. Have a plan of where to go for good carbs. Some of my favorites are Mickey pretzels when strolling around, pizza at Downtown Disney, Mama Melrose and the pasta meals at the resort quick service restaurants. Also, I pack and bring my own breakfast for race morning. I don't leave that to chance! 10. Make it fun! Dress up, run with friends, meet new people, just have a blast! These races are seriously so much fun! Why else would we all do it??? Hope this helps you in your next challenge! We'll see you at Dumbo Double Dare! Don't forget to check out some of the other bloggers sharing some of their favorite tips too! Great tips! I'm not a Disney girl, but sounds like they do the challenge races right.